Editors note: On Tuesday, July 24, 2018, Charlesbridge tweeted their decision to cancel publication of this book. Thank you to all who shared this Open Letter. Speaking up makes a difference to the well-being of Native and non-Native children. 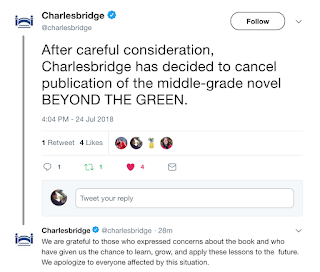 After careful consideration, Charlesbridge has decided to cancel publication of the middle-grade novel BEYOND THE GREEN. We are grateful to those who have given us the chance to learn, grow, and apply these lessons to the future. We apologize to everyone affected by this situation. Below is the Open Letter I wrote on Saturday, July 18. It's not too late for you to make a decision about releasing Sharlee Glenn's Beyond the Green. From what I see, it is scheduled to come out on October 2, 2018. This is an Open Letter, which means that I hope others will read it and think hard before publishing stories about fostering or adoption of Native children. Let me explain why I think you need to take this action. In Beyond the Green, Sharlee Glenn is telling a story about her own life. When she was a child, her family took in a Ute baby. In her author's note, Glenn tells readers that the baby (Gina) was five months old. She doesn't give us details about how social services selected Glenn's family as a placement for Gina. And she doesn't tell us how Gina left their home to rejoin her Ute mother. What she does tell readers is that "Before 1978, children like Dori [Dori is the fictional Ute child in Beyond the Green] who were removed from their homes because of neglect or abuse..."
Here's why that sentence is a problem. Some children are removed from their homes because of neglect or abuse. In every demographic in the US, there are parents who are neglectful or abusive of their children. For their safety, those children are appropriately removed from their parents homes. Prior to 1978, Native children were being taken from their homes at astonishing rates. Were Native parents worse than others? Of course not. A four year investigation into these removals led Congress to pass the Indian Child Welfare Act. Those readers will have read 230 pages of a White child's pain. Who causes that pain? ICWA and the Ute mother and grandmother. The scant information in that author's note is not just thin--it is also incorrect. The most helpful action I can take right now is to ask people to read about the law from people who know what it says. To start, take a look at the website of the National Indian Child Welfare Association. There, you will read that ICWA's intent was to protect the best interests of Native children, and to promote the stability and security of Indian tribes and families. Congress enacted the Indian Child Welfare Act (ICWA) in 1978, after more than four years of hearings, deliberation, and debate, in order to alleviate a terrible crisis of national proportions—the “wholesale separation of Indian children from their families….” Hundreds of pages of legislative testimony taken from Indian Country over the course of four years confirmed for Congress that many state and county social service agencies and workers, with the approval and backing of many state courts and some federal Bureau of Indian Affairs officials, had engaged in the systematic, automatic, and across-the-board removal of Indian children from Indian families and into non-Indian families and communities. State governmental actors following this pattern and practice removed between between 25 and 35 percent of all Indian children nationwide from their families, placing about 90 percent of those removed children in non-Indian homes. In a 1973 federal case involving children arising out of the Hannahville Indian Community, Wisconsin Potawatomies v. Houston, a tribal expert witness, Dr. James Clifton, “testified that the assumption of jurisdiction in forced adoption by white courts is a matter of great bitterness among the Indian community.” Michigan Indians grow up with oral traditions and stories about the day that a state or church authority figure would show up at the family’s house to take away Indian children. In 1974, a representative of the Native American Child Protection Council, based in Detroit and serving urban Indians, alleged before Congress that state officials had engaged in the “kidnapping” of urban Indian children. By the 1970s, one out of 8 Indian children in Michigan were adopted out of their families and communities, a rate 370 percent higher than with non-Indians. "[W]elfare workers and social workers who are handling child welfare caseloads use any means available, whether legal or illegal, coercive or cajoling or whatever, to get the children away from mothers they think are not fit. In many cases they were lied to, they given documents to sign and they were deceived about the contents of the documents." More insidiously, state officials often arrived to take Indian children away from their families without any paperwork whatsoever. And then those children often were adopted by non-Indian families far from Indian Country, literally without a scrap of paperwork to conclude the deal. To remedy the problem, Congress enacted the Indian Child Welfare Act, a statute designed to guarantee minimum procedural safeguards for Indian tribes and Indian families in non-tribal adjudicative forums and to clarify jurisdictional gray areas between state and tribal courts. Because Beyond the Green is a semi-autobiographical story, Glenn and her publisher must think it is ok to put this book--with an alcoholic mother who leaves a five month old in a car while that mother gets "drunk as a skunk"--into the world, but I think it ultimately does more harm than good. It exploits a tremendous harm that was done to Native children and their parents. And, Beyond the Green foregrounds the pain of a White child and her family over the harm that was--and is--done to Native children and their families, at the hands of White people. I have a lot more to say about this book, and may be back to do that. The parts about alcoholism and the part where Dori asks "what's a squash" are only two parts that I find very troubling. I've ordered Glenn's previous telling of this same story. In 1998, it was published as Circle Dance. For now, I am pleading with you, Charlesbridge, don't release Beyond the Green. Several people have asked me to append my Twitter review of Beyond the Green to this letter. After looking into options to do that (I used to use Storify but that's gone), I've settled on "Spooler." To use it, you take the last tweet in your thread, paste its URL into the Spooler window, and wait for the app to run. Then, you've got the tweets and images or gifs, compiled like what I've pasting below (I've inserted returns to separate the tweets because they appeared as long paragraphs, and I'm removing the gif because the animation didn't work). I started this numbered twitter review thread on July 15 (Spooler removed the numbering). The last tweet in that thread was yesterday (Jul 21) after I received the 1998 version of Beyond the Green. Here you go! Wow. I'm reading an ARC of a story for middle grade readers that has a Ute mother that is an alcoholic. She loses custody of her baby, who she has left in the car while she's in a bar "drunk as a skunk." The baby is placed with a Mormon family. When she turns 4, the Native mother wants her back. ICWA has been passed, so, the White family has to give her up. But, they make terms. One is that it take place gradually. The second term is that the Native mother joins Alcoholics Anonymous so that she stays sober. Honestly--I'm furious that this author and this publisher are doing this book. It is due out later this year. It reminds me of Alexie telling people that if there's not a Native alcoholic in the story, then, it isn't authentic. That's such a destructive thing for him to say. It gives cover to writers who do crap like this. When the White family takes in this baby, they give her a new name: Dorinda, and call her Dori for short. That's another WTF moment for me. Was that a norm in the 70s? For white people to just up and rename a child they were fostering? The author either has no idea that there's a dark history of Native children being given White names at boarding/mission schools, or else knows but doesn't realize that her White characters doing this is not going to be well-received by Native readers who know that history. Another unsettling point is when the 4 year old starts to spend time with her Ute mother and grandmother (she doesn't know these two women are her family). She returns to the White family after an outing and asks what a "squash" is. Irene's mother, the 4 yr old says, lives with someone named "Did She Wash It Yet" who is a squash. Britt (main char) figures out that 4yr old is trying to say "squaw." Irene's mother had told the 4 yr old that she is "an old squaw who loves you very much." Would a Ute woman call herself a squaw? I doubt it. Why did the author of this book create that?! Oh! Realizing I haven't identified author/book title. The author is Sharlee Glenn; the book is BEYOND THE GREEN. I have lot of notes on the book but am pausing for now. @charlesbridge really ought to pull it before it comes out. It sounds just like Sharlee Mullins Glenn's CIRCLE DANCE, published in 1998 by Deseret Book Company. Before I pause... The author's note says that before 1978, children like Dori (4 yr old) were removed from homes due to neglect or abuse. Some, yes, but ICWA came about because of nefarious removals. This author is misinforming the public. That author's note is incomplete. It mentions culture and language but not a word about sovereignty. What is the publisher's rationale for bringing it out? They expect it to sell, but, on what basis?! This is terrible. In my mail this afternoon was a copy of CIRCLE DANCE, which is the 1998 version of BEYOND THE GREEN. I'm reading through it now. Some minor changes but pretty much the same story. In my Open Letter, I did not note all the problems I've noted in this thread, or the others that I found as I read BEYOND THE GREEN. I may do a follow up blog post, later. One thing I noted that is different: In the 1998 CIRCLE DANCE, the Ute mother is named Irene Uncasam. In the 2018 BEYOND THE GREEN, her name is Irene Uncarow. In CIRCLE DANCE on p. 64, the Ute child, Dori, meets her birth mother (Irene) but doesn't know that's her real mother. She's introduced to her as "Miss Uncasam." Dori says "Your hair is pretty, Uncle Sam." Of course, the Mormon family corrects what Dori said. But that stands out to me because on p. 98 of BEYOND THE GREEN, Dori talks about a "squash" Irene lives with, that is named "Did She Wash It Yet". Glenn uses a 4 year old Ute child's spoken words to mock the Ute names that she (Glenn) gave to the Ute child's mother and grandmother. That is... messed up. The Mormon family corrected the 4 yr old when she said "Uncle Sam" and that happens again. Britta (main char) tells the child not to use the word squaw. I skimmed reviews on Goodreads & NetGalley. Frightening that they don't note these problems! In BEYOND THE GREEN, after Dori has spent a lot of time with Irene and is back with the Mormon family, Dori takes the Mormon mother's face in her hands and says "Mama, you're a white person." In CIRCLE DANCE, it is "Mama, you're a honky." Another change from CIRCLE DANCE to BEYOND THE GREEN is name of an elderly Ute man who Britta (main char) thinks is a drunk. In CD his name is Red Ant Colorow. In BtG his name is Red Hawk Samawop. Some of these changes will strike some people as indicative of growth on author's part, from 1998 to 2018, but the things that are in BtG are so bad that the changes strike me as similar to what Drake did in THE CONTINENT: superficial. Thank you for your careful attention to the ARC of BEYOND THE GREEN. On Wednesday (July 18), after first hearing of your concerns about my book, I sent an email to your dreese.nambe@gmail.com address. Please let me know if you received that email or if I should send it to a different address. I hope you know how genuine I am when I say that last thing in the world I want to do is misrepresent either the ICWA or the horrific actions (i.e., the removal of native children from their homes and the placement of them with white families) that led to its passage. Which is why I reached out to you early on (in 2014) to ask if you would be willing to give feedback on the manuscript. My publisher reached out to you again in 2016 with the same request. At that time, you suggested that we find a reader from the Ute tribe. This was excellent advice which we acted upon immediately. We were honored to have Mr. Forrest S. Cuch, Ute Elder, former director of Utah's Division of Indian Affairs, author of A History of Utah's American Indians, and founding board member of Rising American Indian Nations (RAIN) give the manuscript a careful reading, and we were quick to act upon all his suggestions. We have worked very hard to try to ensure that this story of a young white girl who, throughout the course of her journey, begins to see beyond her own own biases and prejudices is as fair and accurate and sensitive and nuanced as possible. If there are further adjustments that you would suggest, we would be honored to hear them. Thank you for the invaluable service that you provide, Dr. Reese. 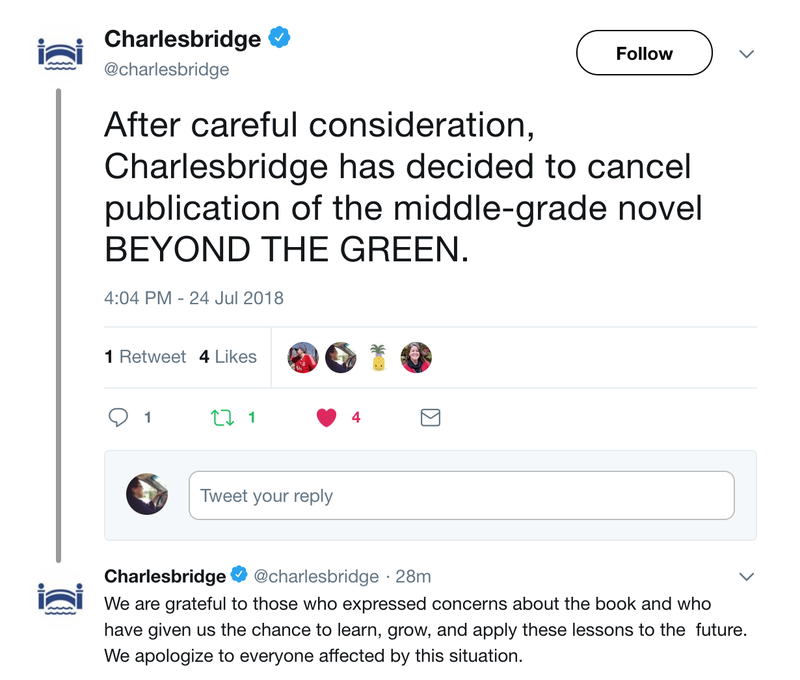 Debbie (and Charlesbridge, if you are reading, read on), I hope you will permit this comment to be posted, because it has a different point of view on BEYOND THE GREEN. Debbie, most of the time you are on target, but I think the call for Charlesbridge not to publish this novel is a mistake. This book is what used to be called a roman a clef, which in the parlance of the 21st century is#ownexperience. The author is writing fictionally about something that happened to her, and recollecting it This is how she depicts it. That her depiction may upset some readers does not make it any less #ownexperience, nor denigrate the #ownexperience of any other writer. We should be encouraging more writers to write #ownexperience, not challenging the very publication of their books or their own post-modernist version of truth. If young readers are sophisticated enough to realize that THE HATE YOU GIVE is not an indictment of all police officers, but just Thomas' take on an ugly aspect of policing, then they are sophisticated enough to handle this story and understand it. I hope its publication goes forward, and that it leads to more #ownexperience narratives, whether fictionalized or in memoir. Anonymous, Debbie has a PhD. I think you can assume she knows what a roman a clef is. A roman a clef is not an impartial video recording. The author chooses what to highlight, whose point of view is important, what to leave out. It is no more truthful than any other work of fiction. Something being true to a given author's memory does not mean that it does not perpetuate harmful stereotypes. And I don't see any inherent value in romans a clef such that we should encourage more writers to choose that form over another. This is amazing news! It's a win all around--for the power of determined advocacy for Native children everywhere, for a publisher's willingness to listen to reason and make a difficult decision, and for all young readers who struggle for the opportunity to hear the truths of history as told by #ownvoices. Great congratulations all around, and especially to you, Debbie, for digging your heels in, again and again. Thank you South for speaking up and for getting the book pulled. As a native Adult who read too many bad native books written by white people in hopes of finding a character like me, I really really appreciate it.